Last month, you may recall our addition of SecureCom Video’s Network Video Recorder (NVR) to the DMP video product line. 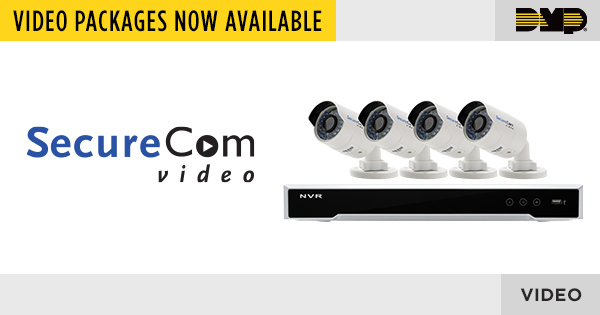 Today, we’re excited to announce the addition of two discounted packages featuring our best-selling SecureCom cameras, which we’re bundling with the new NVR to offer savings and yet everything you need for secure high quality video monitoring. The new NVR is designed exactly to DMP alarm system specifications and features EASYConnectVPN for secure mobile connectivity. While it supports any SecureCom Video or ONVIF compatible camera, the combined packages include four of either the SecureCom Bullet or SecureCom Dome cameras, both delivering the versatility of indoor/outdoor performance. Within a couple of minutes of plugging in the cameras, the NVR detects and configures automatically for a plug-and-play installation. Coupled with that, the NVR provides POE, eliminating the need for external power supply. For pricing information, please log in to Buy.DMP.com to view the Latest Price Notifications and Updates under Pricing Notifications. To review our expanded commercial video options, visit DMP.com/Video. If you have any questions, please contact DMP Inside Sales at 877-757-4367 or InsideSales@dmp.com.